It’s National Potato Day! We all love to eat potatoes and potatoes have been a popular parts of diets around the world for centuries. Did you know that more than 45 billion pounds of potatoes are harvested in the U.S. each year? We can bake them, mash them, turn them into hash browns, fry, and everyone's all time favorite French fries — the list is endless! The potato is an unusual little tuber which played an important role in the history of the world and was, in fact, the primary food crop for an entire nation. Celebrate this Potato Day and give a tribute to this wonderful vegetable. 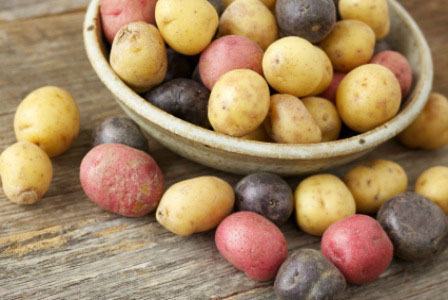 Potatoes are not only tasty— but they’re good for our health too. Did you know that they contain high levels of important vitamins and minerals, such as vitamin C, potassium and iron? Did you know that potatoes were first cultivated by man in Southern Peru and the Northwest regions of Bolivia sometime between 5000 and 8000 BC? From then on forward it has; spread all over the world to become one of the primary staple crops of many cultures. While potatoes are the favorite part of American cuisine, with millions of different forms of preparationto be found. You can also use potatoes to make bread, rolls and pancakes. For instance Ireland was so conditional on the potato as a food crop; that a potato plague managed to starve the entire country. Make no fault, there was abundance of food being grown in Ireland at that time, and it is said that 5 ships full were being sailed out of the country each day, but the people of Ireland were being drained dry by the English who ruled them at the time, and potatoes and cabbage were all they had to live on. On the other hand, the Russians discovered quite a different use for the potatoes. Potato Day is best celebrated by incorporating the noble potato into every dish you like to prepare on this day. You can add them for your breakfast, or simply bake them and add a pinch of salt and pepper, drowned in sausage gravy and cheese. For lunch, you can have a bag of potato chips, especially if you spread them across your sandwich to give it a nice crunch. What’s Your favorite potato treat?